At least 1,000 federal workers and supporters came out on a cold and windy day in D.C. to demand President Trump agree to reopen the government or, failing that, Senate Majority Leader Mitch McConnell agree to hold a vote on a House-passed measure to fund all federal agencies except the Homeland Security Department for the rest of the fiscal year. Homeland Security would be funded until Feb. 8. Sen. Chris Van Hollen, D-Md., recounted the story of one of his constituents, who is struggling to pay her bills as a result of the shutdown. 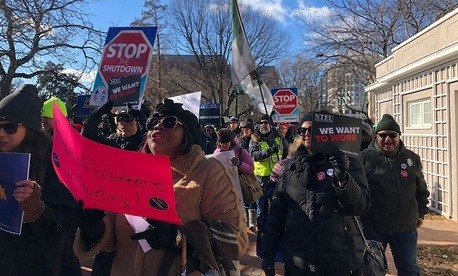 Patricia Herbert, a 30-year Internal Revenue Service employee, told Government Executive that the shutdown is having a profound impact on her finances and health. Mark Pellerito, a member of the National Weather Service Employees Organization who has been working without pay since the shutdown began, recounted the impact that the uncertainty has had on one of his coworkers in particular. Talten Hall is a member of the National Treasury Employees Union and a furloughed gardener with the National Park Service, working at Lafayette Park and the Ellipse outside of the White House. Jamie Rodny, a National Federation of Federal Employees member and an investigator at the Housing and Urban Development Department’s Office of Fair Housing and Equal Opportunity, stressed although it is important that federal workers be provided financial certainty, the shutdown is also affecting millions of people who rely on services provided by the unfunded agencies.